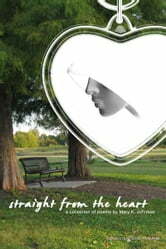 Straight from the Heart is a collection of poetic works by Mary K. Johnson. She describes it in her own words: "Each poem I have written was inspired by the walks we take through life. We are alike more than we might realize. There are five senses we all have in common, and I used this fact to touch bases with all feeling, emotions, thoughts and doubts, of each and every one whether good or bad. It's easy to say, “Wow, I have always thought that same way, or felt that same way.” But we never realize that someone else is also feeling what we feel, is going through, or has already gone through that same thing you or someone has. In other words, I like to keep my writings as real as life itself. I only give what I got. If I can see something, word it up real pretty and share it with someone, then I feel I'm doing what I was meant to do. Getting my words in rhyme out there, and not selfishly trying to keep it to myself."